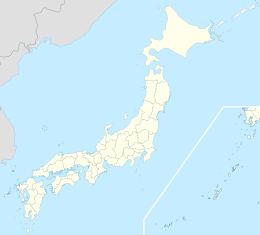 Kii Ōshima (紀伊大島) is an island lying 1.8 square kilometres (0.69 sq mi)[verification needed] off Cape Shionomisaki, the tip of the Kii Peninsula and the southernmost point of Honshū, Japan. It falls under the administration of the town of Kushimoto in Wakayama Prefecture. About 2000 people live on Kii Ōshima. The island has an area of 9.68 square kilometres (3.74 sq mi) and measures 26 kilometres (16 mi) around. Its east-west extent is 8 kilometres (5.0 mi), and its north-south extent is 2.5 kilometres (1.6 mi). A series of three arch bridges connects Kii Ōshima to Honshū. The road over the bridges opened to through traffic on September 8, 1999. The Japan-U.S. Friendship Memorial Hall on the island commemorates the visit of the trade vessels Lady Washington, under Captain John Kendrick, and Grace, under William Douglas, in 1791. These ships and their crews were the first to visit Japan from the young nation. The town of Kushimoto operates the two schools on the island. They are Ōshima Elementary School and Ōshima Middle School. ^ "Kushimoto Town Tourism Association - Oshima-Island". www.kankou-kushimoto.jp. Retrieved 8 November 2016. This page was last edited on 19 November 2018, at 19:40 (UTC).